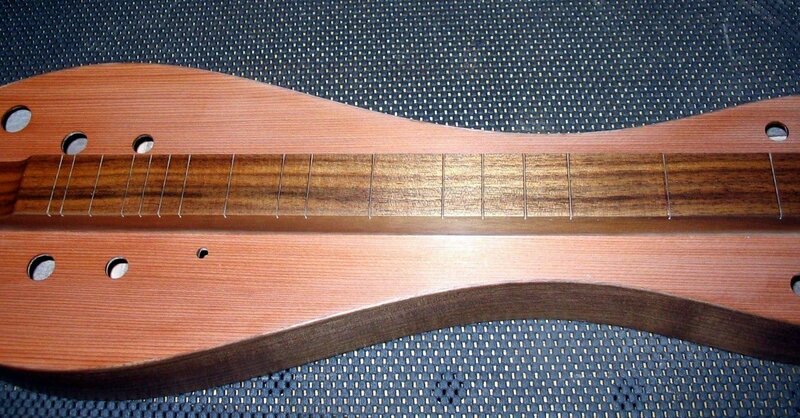 I fret dulcimers after the instrument is completely assembled. Some dulcimer makers fret the fingerboard before gluing it to the soundboard and have good results but I prefer to true up the fingerboard once I know the fretboard won’t move or warp during the construction process. I use a long sanding block to sand the fingerboard dead level. The sanding block is a chunk of 2X4 that I planed flat and checked with a straight edge. There is 80 grit self sticking paper on the business side of the block. It levels the fingerboard very quickly. When the surface of the fingerboard looks evenly sanded I check it for flatness with a steel straight edge. A good straight edge is a wonderful tool. I use it not only for fretwork but also for making sure anything that should be straight and flat is indeed straight and flat. This includes planes, bench tops, shop made tools, etc. when the action is a little on the low side. Most of the relief goes between the fourth and eight frets though it tapers a bit from there in both directions. To put in the relief I make pencil marks in the area I want to relieve and sand those areas with a shorter sanding block. The sanding away of the pencil marks helps me target the right area. I use a small amount of relief as the instrument might end up with a bit more once the dulcimer is strung up and under tension. I check the relief using the straight edge and a feeler gauge. The area of relief should have a gradual tapering towards both ends of the fretboard. Once the fingerboard has the proper relief I sand it with progressively finer grits of paper. Speaking of sandpaper, I should mention that I vacuum all the dust away after each step. make sure they are still deep enough after the fingerboard has been sanded. The fret slots are just a hair deeper than the tang of the fret. 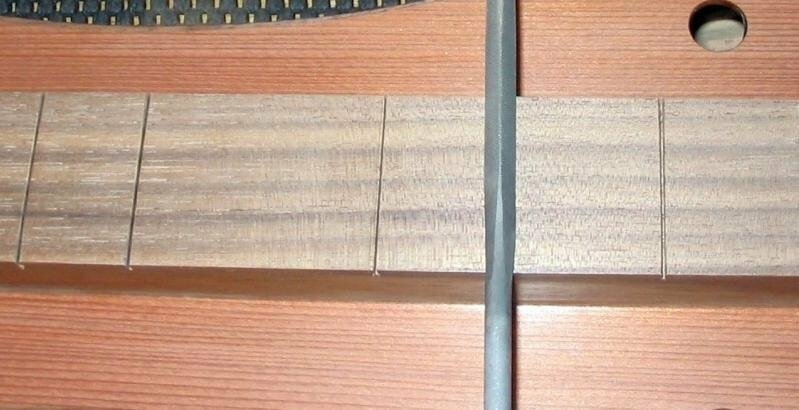 The strips of wood laid across the soundboard are to help prevent the saw from accidentally cutting where it should not cut, like into the top of the dulcimer. This happened once many years ago. I don’t want it to happen again! Frets are not intended to be a permanent part of an instrument. They eventually wear down and need to be replaced. The frets may also need to be replaced if the fingerboard warps and needs to be trued up. I file a slight groove into the top of each fret slot with a triangular needle file. Should the frets need to be removed this slight relief of the edge of the slot will help avoid splintering the fingerboard. At this point I check everything over and if all looks well I oil the fingerboard. Glad you figured out the string length problem. I fret the fingerboard after the dulcimer is completely assembled. I do this so that I can level the fingerboard after the instrument has had some time to relax after being glued together. Many dulcimer makers glue the fretted fretboard to the top before gluing the top to the sides. This works for many of them and it is certainly easier. I have thought of writing a post about how I install frets and your letter has inspired me to do so. I’ll be fretting a few dulcimers next week and I’ll take some pictures. The post above shows how I level the fretboard after the dulcimer is assembled. I then oil the fretboard. My current choice is to use polyurethane oil. After the oil dries I give it a light rubdown with wax. One has to be careful hammering frets after the fretboard is glued to the top. 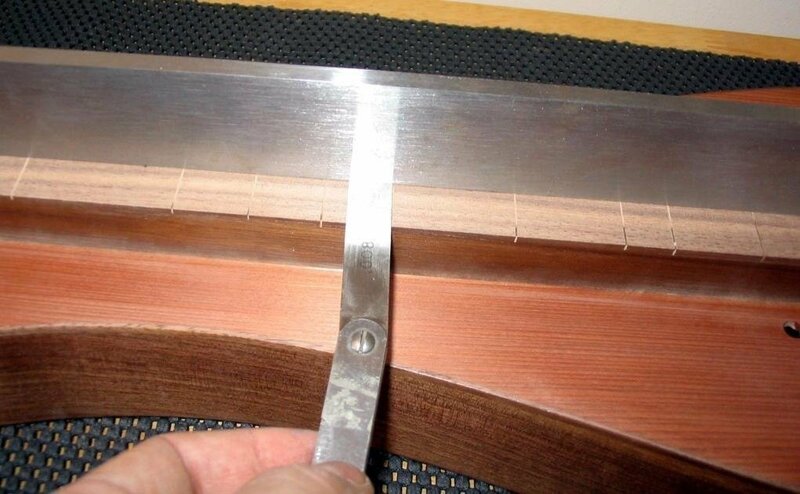 I use a jig to file the tang of the fret a little thinner and use a bit of super glue on the tang. This makes sure the fret goes in with lighter hammering and assures a tight fit. The light coat of wax makes it easy to pop off any super-glue squeeze out. Another option is to cut the fret slots a hair wider. After the frets are in I file the ends, level the frets, etc. I’ll try and get a post up about all this. The pictures will make it less mysterious. It’s a little tricky diagnosing the situation without having the patient on the bench. I have found that shorter string lengths are tricker to intonate correctly. What tuning are you trying to use? It may be that you will have more luck tuning a short scaled dulcimer to something higher than D-A-D or D-A-A. You might find that tuning up to F, G or A works better. When in doubt about a dulcimer sounding sharp I will do what you did; I’ll make a temporary saddle and experiment. I start from the correct mathematical distance from the nut (the total string length) and then move the bridge farther from the nut and/or shape the top of the bridge to accomplish making the sharp string flatter. Let me know if any of this helps. If not we can try again. Dulcimer fingerboards are usually hollowed out to make them lighter. When refretting a dulcimer that I didn’t make I try to determine the thickness of the fingerboard. The sometimes possible and easy way is to get a finger inside like you had done and see if I can roughly gauge how much wood is above the hollowed area. If that doesn’t work I have sometimes drilled a hole with a tiny drill bit through a fret slot and tried to measure the length of the bit at the point when I feel it break through. I prefer fretting a new dulcimer after the body is assembled so I can’t wham it very hard and the same applies when refretting. On a new dulcimer I thin the tang of the fretwire using a jig I got from Stew Mac. It is basically a small vice with files in the jaws and you can run the tang of the fretwire through it and thin it very easily. I get the tang to a thickness by feel that will fit into a fret slot with light, careful hammering (more tapping than hammering) after putting some “super glue” on the tang. This way I get some light compression in the slot as well as the glue keeping things tight and well seated. The other option is to widen the slot; something I have done on refrets but prefer not to do when fretting a new instrument.I have a backsaw with a kerf I achieved by filing the sides till enough set was removed to give me a slightly wider fret slot.I then proceed with the light hammering and gluing to install the frets. 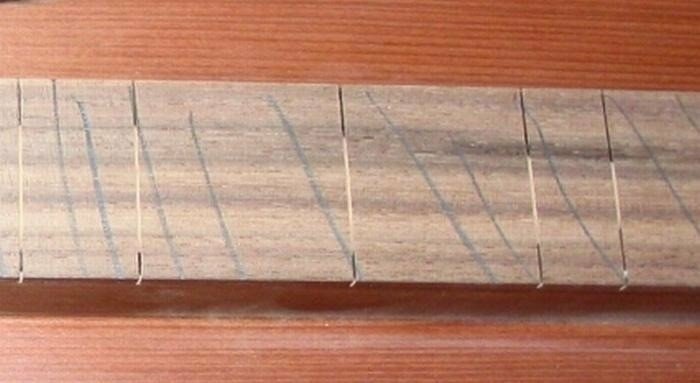 Many luthiers widen fret slots with a rotary tool. I haven’t tried this myself. Let me know if you have any other questions and let me know how it turns out! What timely article. I bought what I believed to be a nice mountain dulcimer a few years back for my wife. Since the purchase it has developed a muted tone when fretting above the 5th fret along with two cracks in the soundboard. Some frets don’t note at all. The issue is the frets toward the bridge are hitting the string when fretted at the 6th fret on to the bridge. Frets 1 to 5 work as expected with nice clear tone. After working the frets a bit, I managed some improvement but it is clear another issue is at work. I looked closely at the fingerboard and the frets and determined there is what I consider an excessive amount of relief in the fingerboard. Excessive being .035 between the 6th fret and the straight edge placed on the fret from 1 to the end. The fingerboard is also quite uneven and tilted toward the low D string. My opinion was that the only resolution was to remove the frets, level the fingerboard and refret. Having no experience or knowledge of the workings of a dulcimer I am leery of that task to say the least. I am comfortable fretting guitars and mandolins so I’m not a novice. When you fret a dulcimer do you use a hammer? It seems an arbor press is out of the question the way it?s made. For example, when I put a finger inside the sound whole I can feel the inside of the fingerboard is hollow. Is that typical? Can you comment on your fretting process? The last thing I want to do is further damage an already cracked soundboard. Is this John from Denver that I knew years ago? I’m tapering from the nut to the bridge but mostly between the 4th and 8th frets. The relief is very slight, a little less than the thickness of the top string (.010.) I actually prevents buzzing because the strings don’t hit those frets when playing in the lower positions where the action is lowest. The fingerboard itself is flat side to side. Are you tapering side to side or end to end? Seems like you would get string buzz if you tapered between he 4th and 8th frets and then taper to both ends. The duties of each moment are the shadows beneath which hides the divine operation.